Just like an insurance, the higher value a car has, the higher the insured amount it will have. In the car loan arena, there is an equivalent irony to this and I would like to express my idea in this article so Pinoy loan borrowers using their vehicle as collateral will have an idea on how to achieve higher loanable amount and avoid getting declined of an auto loan application. As a professional loan consultant, I know to a personal and professional level what influences do lending companies base their appraisal and loanable amount value for a collateral, particularly, a car. These top 5 factors that help a car loan borrower achieve higher loanable amount should be able to help so expectations are met without really expecting so much out of a collateral loan in the Philippines. Take note though that there is a very big difference between this type of cash loan from a personal loan where the risk is higher and the chance of getting bigger amount to loan decreases. Mileage – The mileage of a car is very important both for achieving higher insurance value with lower amortization. I have this experienced early this year 2013 when I applied for a comprehensive car insurance for my Toyota Yaris 2008 and it proved to be right when I got a 490K pesos equity with my insurance even if I have been using my car for 5 years now. Apart from this fact, I also came to learn just today from an experience of a failed car loan client. This customer widthrew her application after getting as much as 220K appraisal value and recommended value from our account officers and getting only 80k at the end of the final approval of her loan. To my client’s dismay, she widthrew her application and decided not to take the loan anymore. Now, how did I arrive at this conclusion? Simple, I asked our approving officer and the account recommending officers as well. Their statements came up with the same explanation – mileage of the car was way too high. The Suzuki Alto 2008 of my client had more than 100k mileage compared to my 2008 Toyota Yaris which only had 53K. Meaning, with both 5 years aged auto, my client had doubled the mileage of her car to mine. Lending companies are very cautious about this so if you want a bigger loan but have higher mileage, consider your request denied. The higher the mileage, the lower the loanable amount will be as well as the appraisal value. Overall Appearance – Aside from mileage, the look of the car (paint, upholstery, engine, windshield, car wheels, mags, sounds and other accessories) and its paint and other internal accessories will definitely play a big role in determining the loanable amount of a vehicle. Lending companies take pictures of the car of the loan application from inside to the outside. The purpose of which is to have a file copy of how the car looks on the time of the loan. This will absolutely be a basis for higher loanable amount because in case a car gets repossessed or foreclosed, the better it looks, the bigger the sale or market value the vehicle has. More profit can be squeezed further from the collateral. Insurance value – This is almost self explanatory but for the benefit of those who still do not know, insurance will determine how the owner cares for a car. If it had a comprehensive insurance, it is more likely to be on top condition and the owner will absolutely stay away from any type of accident and would most likely drive more carefully while the car is encumbered to a financing or lending company. Fair Market Value (FMV) – In case you did not know it yet, market value is always a basis for determining how much a car is worth. The higher the market value, the higher the loanable amount a borrower may be able to squeeze out of his car being used as a collateral to apply for a loan. Lending companies will always have a basis from a figure that is most fair and reliable and where else will they get it but from car selling websites like sulit. If you want to know how much to expect for your car loan, you might want to consider trying to look in sulit.com cars how much your car is being sold. This way, you immediately know and won’t expect too much high amount you though is right for your car. Year Model – If you think you can get high loanable amount for a 2008 car compared to a 2009 car, you must be in the wrong side of the street. No lending company would be fool enough to give you bigger value for your loan with an older year model of a car than a newer. Please note that all factors stated above apply to all vehicle collateral loans. 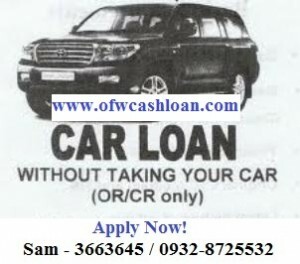 These can be jeepney loan, taxi collateral loan, tricycle loan, truck loan, multicab loan and more.